Elite physique is proud to offer sunless tanning with Mystic Tan HD. 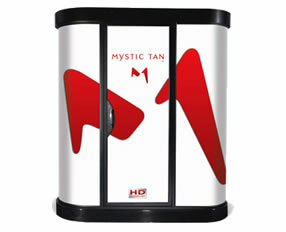 We are the only salon in San Angelo to offer Mystic Tan HD. Mystic Tan, the most scientifically advanced UV-free tanning solution on the market, provides an option for persons who cannot tan by any other method, as well as an additional alternative for an estimated 30 million U.S. "indoor tanners." Mystic Tan makes an immediate fashion statement, creating an even, natural looking tan that peaks four to five hours after application and retains the color for days. Mystic Tan provides a "bronzing" effect without adding to the aging process associated with ultra violet light, and the under-a-minute application is convenient for today’s hectic lifestyles. Mystic Tan’s UV-free element has brought the accolades of dermatologists and skin care professionals, who tout the benefits to their patients and clients. In addition, many people use Mystic Tan to prepare for special occasions: spring break, class reunions, first dates, graduations, proms, weddings, etc. Applied as a spray mist in a booth, Mystic Tan is the only UV-free tanning product in the world utilizing MagneTanTM technology. The MagneTan process polarizes the bronzing pigment and uses the human body’s magnetic properties to attract the mist to the skin evenly and instantly. The tanner simply disrobes in a private room, enters the booth and presses the start button. After 60 seconds, they step out, towel off, and leave complete with an instant tan. Mr.Cooper and his team launched Mystic Tan in 1998, after experimenting with other spray booth prototypes and eventually developing the unique MagneTan technology. "In the beginning, we tested spray booths without the MagneTan technology like others that are appearing on the market," Cooper said. "But there is no comparison with Mystic Tan and the MagneTan technology for a dark, evenly applied instant tan." Additionally, Mystic Tan has a moisturizing quality, because the self-tanning solution with bronzers is made with an Aloe Vera base. Mystic Tan gives tanners an effortless head start and also promotes "smart tanning." Proponents of smart tanning advise those who use tanning beds and who tan outdoors to slowly build a base tan, avoiding burns. Mystic Tan allows tanners to appear tan immediately, even though they may also be using a tanning bed to slowly work toward a base tan.